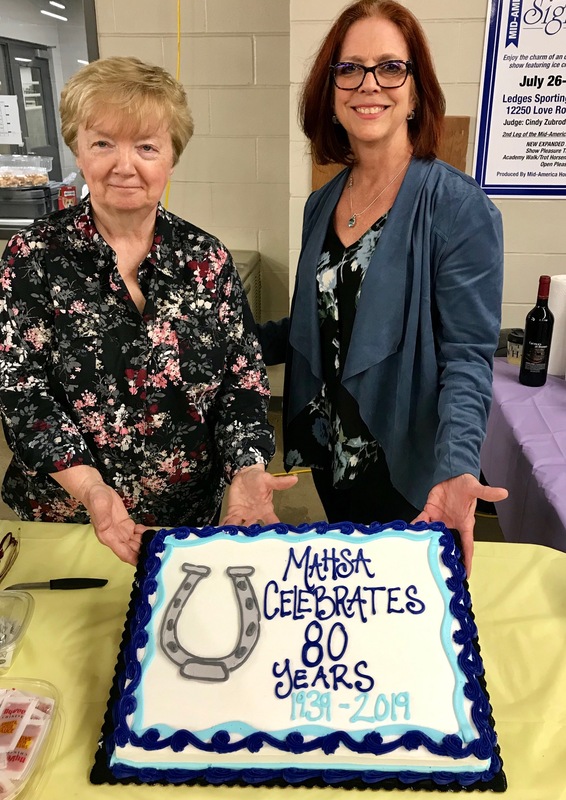 Marilou Wilschke, MAHSA Vice President, and Connie MacQueen, MAHSA President, present the MAHSA Celebrates 80 Years cake at the recent Spring Fling Horse Show, held at the Equestrian Center at Kirkwood.Mid-America Horse Show Association (MAHSA) kicked off a year of celebrating the association’s 80 years of serving the horse show community at its first show of the year, the Spring Fling Horse Show, held at the Equestrian Center at Kirkwood in Cedar Rapids, IA, April 5-7, 2019. MAHSA is one of the largest charter clubs of the American Saddlebred Horse Association, with members who are owners, trainers, exhibitors and admirers of these horses and ponies. The organization oversees a regional circuit of 25 affiliated A, A/B and B rated shows in Illinois and surrounding states where members earn points toward year-end awards. MAHSA produces three of its own horse shows each year – The Mid-America Spring Fling Horse Show, which was recently held in early April; Mid-America Signature Horse Show, to be held July 26-28 in Roscoe, IL; the Mane Event Horse Show to be held October 17-20 in Springfield, IL. MAHSA owns and hosts The Good Hands National Finals at the Mane Event Horse Show. The Good Hands is the first of the three equitation national finals of the Saddle Seat Triple Crown. MAHSA also produces an annual Awards Banquet held in February of each year to recognize the successes of the membership from the previous horse show year. Mid-America Horse Show Association, incorporated in 1939, is a 501(c)(7) non-profit organization pledged to providing an environment for members to fully realize and enjoy their involvement with American Saddlebred horses, Hackney ponies and Roadsters through competitions, education and other equine related activities.